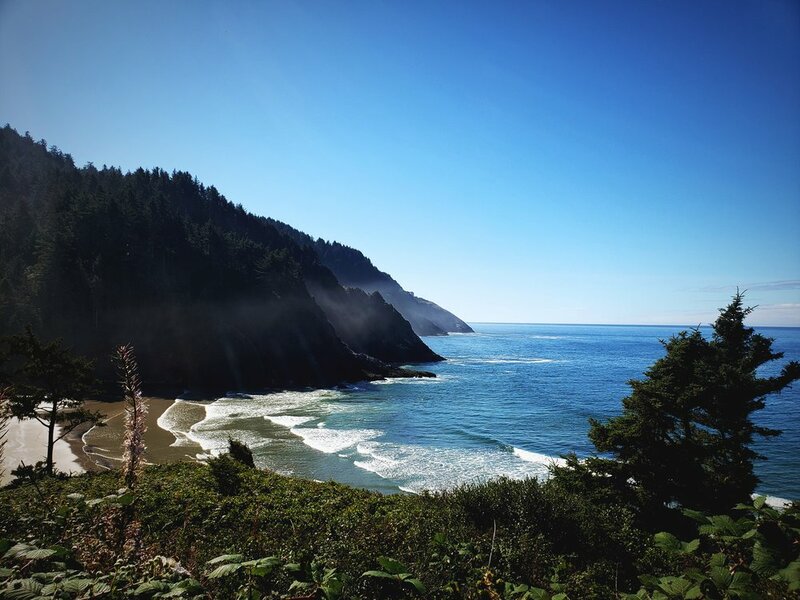 The Oregon Coast is one of our new favorite places, but there is a lot to love in inland Western Oregon too. The Heceta Head Lighthouse, located 12 miles north of Florence, Oregon, stands 205 feet above the ocean. Beginning at a cove tucked into the mouth of Cape Creek, a short trail along a headland leads you to the lighthouse and its outbuildings. Built in 1894, the charming lighthouse is still in operation today, and it’s the brightest light on the Oregon coast. The assistant lighthouse keeper’s residence still stands as well and has been transformed into a bed and breakfast! A trail leads you from the cove at the mouth of Cape Creek to the lighthouse on Heceta Head. These keepers’ libraries would be exchanged every few months between lighthouse keepers on the Oregon Coast. Free tours are offered at the lighthouse. When we visited an extremely knowledgeable volunteer named Sylvia gave us a detailed tour of the structure. Even having recently visited Yaquina Head Lighthouse and the Cape Meares Lighthouse, we learned new details about the lives of the lighthouse keepers. Unfortunately, the lighthouse tower is undergoing repairs, so we couldn’t climb the stairs to see the Fresnel lens. 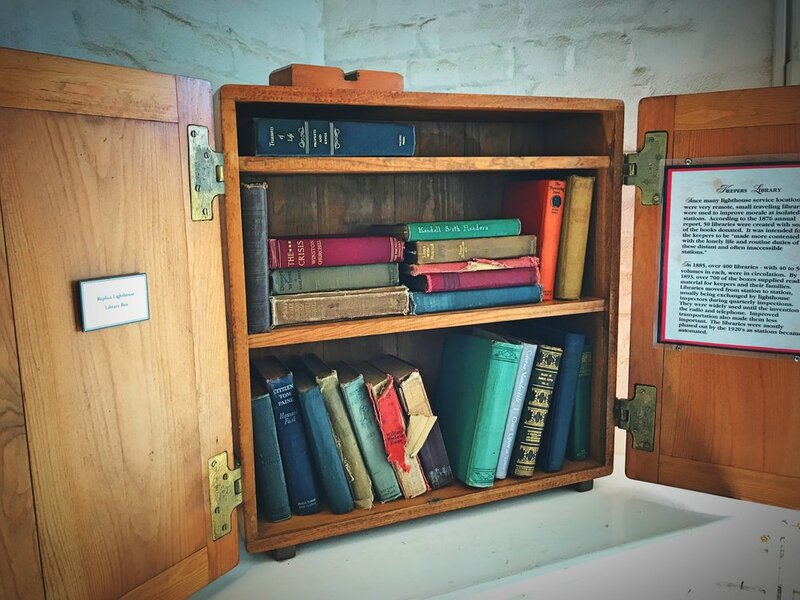 One of our favorite parts of the tour was seeing the library box—a wooden box full of books that would be exchanged from lighthouse to lighthouse like an old-timey little free library. The Heceta Head Lighthouse was first lit in 1894. Looking up the tower at Heceta Head Lighthouse. Besides the lighthouse, there are a lot of old out buildings and keepers’ residence to check out. Just inland from the Oregon Dunes National Recreation Area is the Siltcoos Lake Trail in the Siuslaw National Forest. The 3.4 mile trail runs through old second growth forest. It feels like a trail going through Middle Earth—it’s so lush and there are so many shades of green. Lining the trail are massive Western Redcedars, which are very resistant to rot—throughout the forest you can spot the massive mossy stumps of timber that was cut down long ago. With the woods as beautiful as they are now, you can only imagine what the forest must have looked like 200 years ago before it was logged. We did an early morning trail run around the lollipop loop. Though there are some minor ups and downs in elevation, the trail has a good surface for running. Besides running there are also backpacking campsites along the trail and the trail is open to mountain bikers. In order to get a view of Siltcoos Lake, you have to go into the campsites and down to the water’s edge. This interesting tree had a huge branch that has become second trunk, because the original canopy of the tree had broken off. The Siltcoos Lake Trail takes you through a beautiful green and mossy trail in the Siuslaw National Forest. Starting at Reedsport and running from the coast to inland Oregon, the Umpqua River Scenic Byway is a great drive. The highway follows the Umpqua River and across the river there are moss-covered cliffs. Just in from the coast is the Dean Creek Elk Viewing Area. A herd of about 60-100 elk live in the valley, and you’re almost guaranteed to see elk while driving on this road. The Covered Bridges Scenic Bikeway runs through pastoral Lane County, which has more covered bridges than any other county west of the Mississippi. The 37-mile bike route passes six historic covered bridges. Half of the ride is road-free because it goes along the Row River Trail, a mostly flat but kind of bumpy paved Rail to Trail. Ian posing by the picturesque Mosby Creek Covered Bridge along the Covered Bridges Scenic Bikeway near Cottage Grove, Oregon. We began our ride at the Mosby Creek trailhead. It was nearly 90 degrees the day of our ride, so we decided to cut it a bit short by just going out and back on the paved Row River Trail and skipping the portion of the ride on the road. Halfway through the ride the trail is densely shaded as it circumnavigates the large Dorena Lake. Since it was fall the fields that surrounded the trail were golden, and because of all the nearby fruit trees, the air literally smelled like apples! On our way back we found some pear trees and stuffed our jerseys full of windfalls. That night we enjoyed ice cream with red wine poached pears. We noticed this cute little painted rocks at one of the rest areas along the trail. We found a bunch of ripe yellow pears along the trail. They were a bit bruised so we poached them. Near Heceta Head and the Siuslaw National Forest: We camped at the trailhead for the Siltcoos Lake Trail. We arrived fairly late in the evening, and it was a quiet place to spend the night. Since backpacking is allowed on the trail, we figured that as long as we had our annual America the Beautiful federal lands pass displayed, overnight camping was probably fine. In the morning we even realized that another vanlife couple had parked there as well. If you want a free shower while in this area, we stopped into Jessie M. Honeyman State Park. We parked in the day use area and just walked into the campground to the bathhouse. As long as you have the $30 Oregon State Park pass, which allows you to visit all the state parks in Oregon all year, this is an easy way to take showers. The Siuslaw Public Library in Florence, Oregon is a really nice place to spend a bit of time and find some free WiFi. The Umpqua National Forest has some really great free, dispersed camping along many of the forest service roads. The spot in the Umpqua National Forest site was a peaceful place to spend a quiet morning in the van. Near Covered Bridges Scenic Bikeway: We camped at a beautiful site called Hobo Camp in the Umpqua National Forest. The site was right by a perfectly clear Brice Creek, and we were surrounded by trees draped in green moss. This is a spot that would work even for tent camping. There was even a picnic table and a fire ring. We also spent a night parked at the Row Point Trailhead of the Covered Bridges Scenic Bikeway. There were no signs prohibiting overnight parking but the trail is only open from dawn to dusk so parking overnight here may not always work. Obviously this spot would only work for self-contained vehicle camping. The Cottage Grove Public Library is a good place to find WiFi and AC after a hot bike ride.